A controversial climate change sculpture was removed after it upset donors from the energy industry in the US. Kevin Smith asks whether corporate sponsorship by companies like BP and Shell has an affect on artistic freedom in the UK. It’s hardly breaking news that big fossil fuel companies often exert a great deal of influence over political processes through campaign contributions and lobbying. On 13 September, the New York Times, for example, reported that, with nearly two months to go before Election Day on 6 November, estimated spending on television ads promoting coal and more oil and gas drilling or criticising clean energy had exceeded $153 million this year. But how do the oil, gas and mining industries exert influence over the cultural sector? A recent American example is instructive, demonstrating how this influence can lead to institutions buckling under political pressure, censoring art and lying to the public. “Carbon Sink: What Goes Around Comes Around” had barely been installed at the University of Wyoming before it was removed without warning in May 2012. 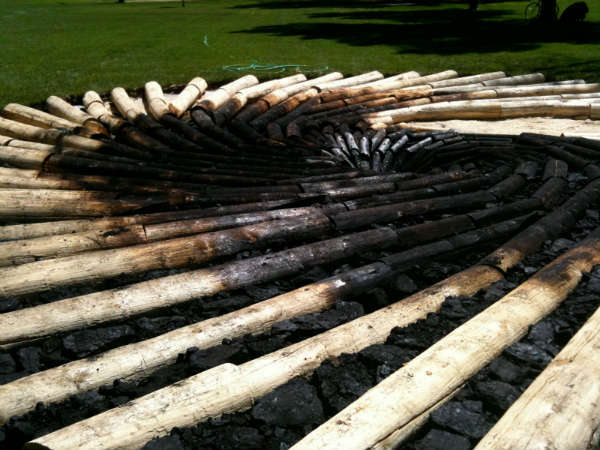 The installation, which was 36-foot in diameter, consisted of a “flat whirlpool of beetle-killed logs spiraling into a vortex of charred, black wood and studded with large lumps of Wyoming coal”, representing natural and human-induced global warming. They get millions of dollars in royalties from oil, gas and coal to run the university, and then they put up a monument attacking me, demonising the industry. I understand academic freedom, and we’re very supportive of it, but it’s still disappointing. Bowing to pressure from both the local mining industry — a major university donor — and outraged local Republican officials, the university removed the installation after less than a year. It’s worth noting that in the fiscal year 2011 the university received $43.1 million in private donations via the University of Wyoming Foundation — when releasing the figures, fund president Ben Blaylock said donations from the energy sector were on the increase. After initially claiming the sculpture was removed because of water damage, in October a local radio investigation obtained emails that revealed the university actually decided to remove Carbon Sink “because of the controversy it generated”. This episode is extreme, but it’s not entirely isolated. In December 2011, fashion label Lacoste demanded the removal of artist Larissa Sansour from a Swiss photographic competition it was sponsoring for being “too pro-Palestinian”. In the UK, draconian cuts to public spending on the arts sector means that more organisations are being pressured to find corporate sponsorship. But is the price sacrificing content? Arts Council England, which supports museums, galleries and theatres, has had its government funding cut by 29.6 per cent last year. Arts and cultural organisations are now much more reliant on private contributions. In the UK, some of the most high profile arts sponsorship deals have been with the oil industry: the Tate galleries have taken money from oil giant BP for more than 20 years. At the end of 2011, BP announced a £10 million deal for four arts institutions, including Tate, over five years. BP also sponsors the British Museum, the Royal Opera House and the National Portrait Gallery, while Shell is a long-term sponsor of the Southbank Centre. Increased levels of corporate sponsorship of the arts can lead to overt interference in programming and curatorial decision-making but there hasn’t yet been a smoking gun incident on the scale of what happened in Wyoming. One can only speculate what the response might be from BP if Tate Modern were to use the iconic Turbine Hall for a large installation that explicitly referenced the environmental and human rights abuses of the oil industry. There are justified fears that long-standing sponsorship arrangements lead to self-censorship — one of the most pernicious enemies of freedom of expression. If overt political pressure is brought to bear we stand a chance of discovering it, but we will never have conclusive evidence of what has not been programmed, who has not been invited, which work has not been made, or which issues have not been tackled. In 2011, at an oil-related event at the London Literature Festival at the Southbank Centre, a duty manager insisted on vetting materials on a stall in case they were critical of Shell, while in 2010, Tate staff sought to ensure that a workshop on disobedience didn’t go anywhere near the issue of the gallery’s sponsors — accidentally giving birth to the art-activist collective Liberate Tate in the process. This sort of self-censorship is arguably a far harder nut to crack, and one that serves corporate sponsors’ purposes far more successfully than a sponsorship agreement that sets down in writing what can and can’t be said, made, or done. There’s an institutional opacity of Tate and others in refusing to “go there”on the subject of controversial sponsorship choices, beyond trotting out a series of platitudes as to BP or Shell being great friends to the arts. Sadly, we may have to rely on initiatives like ArtLeaks, which gives an anonymous space for people within these institutions to give insight into the inevitable impact of corporate sponsorship on many of the UK’s most prominent institutions. Kevin Smith campaigns on oil sponsorship of the arts for Platform, an environmental and human rights organisation that combines arts, research and activism. He is the co-editor of Not If But When – Culture Beyond Oil.